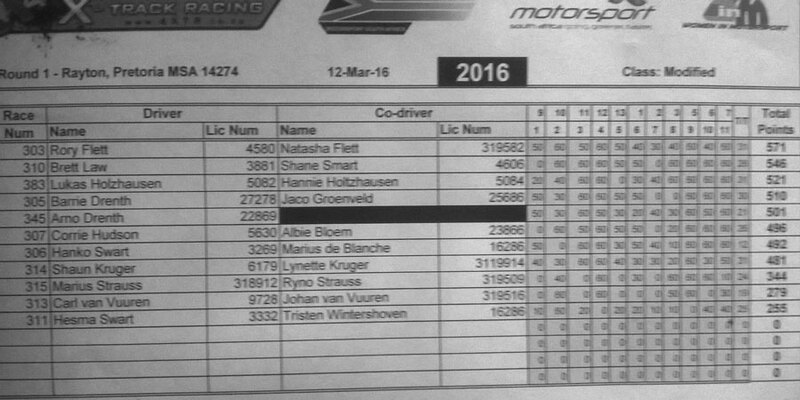 The first round of the 2016 SA National 4XTR Championship got off to a big start near Rayton on Saturday 12 March! Team Z-Factor Racing was well represented by Barrie & Arno Drenth and Hanko & Hesma Swart, all of them sponsored by Maxxis Tyres and Billstein dampers. Elinem Engineering and Bradbri Engineering also stepped up to the plate with special parts for Arno, Hank and Hesma. We look forward to an exciting season ahead with all our sponsors and new team! Hanko and Arno competed in vehicles that were only finished the night before the event and both had a few teething problems to contend with on the day, but they gave a very good account of themselves with promises of real action to come in the next event at Rustenburg on 9 April! Arno competed in Jon Burke's original Modified Class vehicle, this vehicle started the revolution towards pipe frame Modified Class challenge vehicles and Arno was like a young buck set free! The fact that this vehicle is left hand drive did cause him some unnecessary banner hits on the right hand side, but with a little seat time this too shall pass! Hanko showed great promise with a brand new rotary engine built specifically with 4XTR events in mind and I'm sure we shall see him higher up on the leader board as the season progresses! Barrie and Hesma's cars were finished well before the event and Barrie used last weekend's practice sessions to good advantage to slip into 4th position on the leader board. Below is the score board for the Modified Class, things are pretty tight up there what with a total of 6 National Champions competing in this class!